Observed at Eldoret Kenya. December 2013. 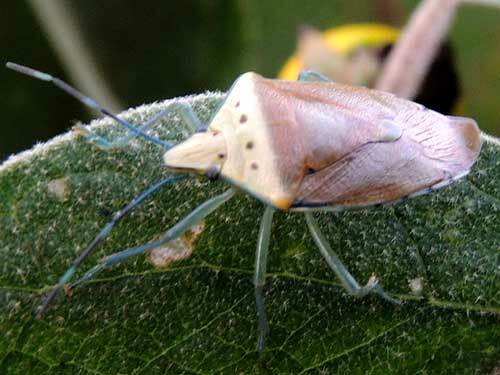 Most insect species in Kenya do not have common English names; 'Blue-Legged Stinkbug' is my suggestion. It is about 10mm long. It was found possibly feeding on fruits of Bitter Apple Nightshade (Solanum incanum). This handsome insect is a kind of stink bug which feeds by inserting piercing-sucking mouthparts into developing fruits or young plant shoots and with a powerful pump extracts fluids. The fruits, and especially the seeds, may wither or become secondarily infected by molds as a result of this feeding activity.